A great person once said, "When a man is tired of pandas, he is tired of life." It may have been Samuel Johnson, or it may have been me, but that's irrelevant. The point is that pandas are the best, and now you can play with three of them! 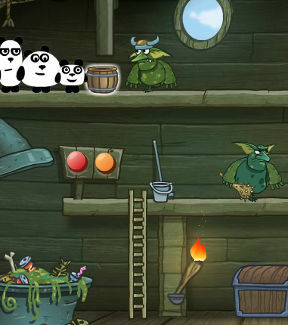 3 Pandas in Fantasy is a cute-as-a-button point-and-click game by FlashTeam with a fairy tale plot. You've got your dragons, wizards, faeries and, um, a house with wings, and our three furry friends have to traverse the fantasy land and defeat a bunch of villainous goblins. The pandas even have some special abilities to help them along the way, as if they weren't awesome enough. All you need to play is a mouse, and your cursor will change depending on what action you can perform. The pandas all move together, unless you click on a specific one. The goal is to reach the exit point (usually on the other side of the screen), which is somehow blocked, and your three fluffballs will have to cooperate in order to find a way out. The controls are a little clumsy (don't even try to play with a touchpad), and this can be unnerving in the levels that require quick reflexes, but there's only a couple of those. The only real problem with this game is the fact that it's quite short. You're skipping along happily, helping fairytale creatures and outwitting goblins, and then the boss fight is there before you know it, and your inner child is pouting and asking for more. When a game is as well made as this one, with its charming level design, interesting characters and solid gameplay, it's really a pity that there isn't more of it. A handful of levels and some more difficult puzzles would certainly go a long way. As it is, 3 Pandas in Fantasy is still a lovely little rainy-day, coffee-break kind of game. And if you want more pandas (and who doesn't? ), you can catch them on their holidays in 3 Pandas in Japan. Controls are clumsy and inconsistent. I ragequit on the second level because they kept walking off the mushroom when I tried to find the hotspot for the second jump. I don't think the controls are that inconsistent. However, that level with the fairies in a cage and the ogre? How stupid can that glowing fairy be, anyway? Why on earth does she wake the ogre? Why not just release her friends from the cage, and then everyone can quietly go on their way? I quit on the level with the cannons and flying castle. After taking out the cannons and getting the pandas into the slingshot and shooting them over, the pandas kept getting stuck in the air. After 3 times of having to redo that level I quit. I don't know what to do after releasing the pink monster. An white arrow appears, but only small panda can get it. Controls are dreadful, game play is poor at best. Trying to beat the end of level 'boss' is almost impossible with such poor control response. Massive let down, had to give up on it! The pandas bounce when they jump on the dragon's arm. So just get them to climb on the arm and they should bounce right up to his back. So I'm at Ogre/fairies level and I think I hit a glitch? The ogre threw a few rocks at me, I used one to release the fairies, 1 to knock ogre off his perch, and a few bounced off my umbrella but didn't hit anything. Then the ogre throw another at me and the rock freezes in midair. Everyone still blinks and I can still move my umbrella, but nothing else works. I can certainly say that the rock isn't supposed to get frozen mid-air. Try the level again, it's probably just a momentary glitch.